"The leadership qualities that Burton showed in his research choices and teaching carried over into university governance where he always pulled a long oar. 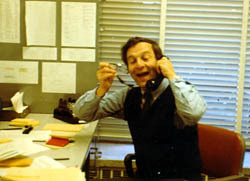 ...Burton was invited to serve as the first divisional Dean of Social Sciences at Berkeley, from 1971-1974. In this capacity, he oversaw the chairs and departments of Berkeley's largest academic division, most of which dominated the National Research Council ranking of American graduate programs. ...I always admired and hope that I learned from Burton's ability to lead with integrity and a clear head while being close to those with whom he worked." William S. Simmons, Professor Emeritus, Anthropology. In "Introduction" to Burton Benedict, A Social Anthropologist in Britain and Berkeley. Burton Benedict, A Social Anthropologist in Britain and Berkeley. An oral history conducted in 2000-2001 by Suzanne B. Riess. Regional Oral History Office, The Bancroft Library, University of California, Berkeley, 2002.